In a survey The Dartmouth emailed campus Monday morning, students overwhelmingly expressed support for the Greek system as it stands. Following a meeting of Greek leaders and administrators on Sept. 17, Greek councils and presidents have seen their schedules filled with internal and external meetings on different proposals for Greek life reform. This fall, Gender-Inclusive Greek Council president Noah Cramer ’16 said his weekly schedule has shifted from three meetings to as many as six or seven, in addition to numerous informal meetings with other Greek leaders. “Now, Greek leaders have been put into the role of change agents,” he said. New financial aid policies, the system-wide elimination of pledge term, a website detailing policy proposals and faculty dissent dominated campus dialogue about the Greek system this fall. At the mid-September meeting attended by College President Phil Hanlon, Board of Trustees chair Bill Helman and “Moving Dartmouth Forward” presidential steering committee chair Barbara Will, Hanlon charged Greek leaders with reforming their organizations’ policies on freshman safety, hard alcohol, adult oversight of social spaces and new member probation periods. Of 279 respondents, around 87 percent said that the Greek system should not be abolished, and 86 percent said that Greek organizations should not be required to become coeducational. About two-thirds of respondents said national sororities should be incentivized to disaffiliate from their national organizations. Among the respondents, 57 percent identified as male, 43 percent as female. Twenty-eight percent said they were members of the Class of 2015, 29 percent members of the Class of 2016, 22 percent members of the Class of 2017 and 21 percent members of the Class of 2018. Thirty-eight percent of respondents said they are not affiliated with a Greek organization while 62 percent said they are. Interfraternity Council and Panhellenic Council voted to eliminate pledge term, granting new members the full rights and privileges of current members. Fifty-six percent of respondents said they approved of this decision, while 35 percent opposed the move. Half of those surveyed said that the ban was somewhat effective, while an additional 15 percent said it was very effective. Thirty-one percent said that the pledge term ban was not effective. Before the beginning of Panhell sorority rush, Panhell announced that no member would need to work for financial aid for membership dues. Rush reforms announced by Panhell in the spring saw mixed success this fall. Although Panhell asked houses to invite back additional members to the second round of parties, two sororities did not call back additional potential new members. Panhell also implemented a survey to assess rush participants’s views after reports of bias in its recruitment process. Panhell president Rachel Funk ’15 said at the time that the group hoped to see if “rumors that rush is racist and privileges certain types of women” were true. In late October, the Greek Leadership Council changed its representation policy so each of Panhell’s eight sororities now has 1.875 votes, while each of the 15 IFC fraternities and three GIGC houses will continue to have one vote. Dartmouth’s faculty voted 116 to 13 to eliminate the Greek system at a meeting on Nov. 3. Biology professor Ryan Calsbeek, who made the motion in the faculty meeting to abolish the Greek system, warned against superficial reform. Respondents to Monday’s survey were divided on whether the changes made to the Greek system this fall were positive, negative or neutral. When asked how much they believed the Greek system changed over the course of the term, 42 percent of respondents said it was slightly different, 25 percent said it was moderately different and 8 percent said it was very different. Twenty-two percent of respondents said the system has remained the same. On Nov. 7, the GIGC, IFC and Panhell released proposals detailing recommended changes to policy areas affecting the Greek system, including high-risk drinking, sexual misconduct, freshman safety, house renovations, faculty advisors and inclusivity. 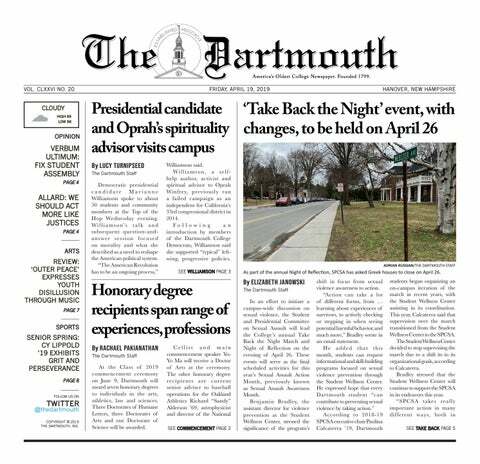 The proposal, released through a website titled “Moving Dartmouth Forward – The Greek Perspective,” called on students and alumni invested in the Greek system to sign their names in support. Fraternity alumni advisors consulted with students as they drafted the proposal. Among other measures, the document included commitments by the IFC and Panhell to work toward meeting 100 percent of the needs of members in aid and to introduce more stringent sober monitoring policies in houses. Greek leaders have already ordered numerous pieces of apparel to easily identify sober monitors at parties. Biology professor Lee Witters, who voted to abolish the Greek system at the faculty meeting, highlighted gender diversity and lack of inclusivity as his main issues with the Greek system in its current form. “We’ve tweaked it and tweaked it and tweaked it, and I don’t think these are sufficient to fundamentally change the way our students live together,” he said. Witters said the Greek system has not notably changed since he began teaching at Dartmouth 30 years ago, and the faculty’s desire to abolish it has changed little during that time as well. Calsbeek said that while he believed the Greek system is not solely responsible for various social ills at Dartmouth, replacing it with other options, like more college-organized social events and a “burgeoning campus bar scene,” might solve certain problems on campus. Dimitri Gerakaris ’69, the alumni advisor for Beta Alpha Omega fraternity, said that the reforms implemented this fall were part of a string of positive changes since the early 2000s. “There’s really a groundswell right now to make things much better,” Gerakaris said. Gerakaris said he believes that continued change must come from students, not administrators, adding that negative perceptions of the Greek system results from the behavior of relatively few students. Funk and IFC president Wil Chockley ’15 did not respond to repeated requests for comment, nor did Panhell or IFC presidents.